Germans Helped To Conquer, Occupy N.Y.
As a relatively small island of only eight million people, England had difficulty trying to rule a world-wide empire. When the Americans began to demand their rights, there were limits to the number of men that the king could send to keep order in the colonies. Not only were there many other parts of the empire to defend, but there were nearby enemies in Europe who would jump at the chance if the number of troops on hand in England was low enough to present opportunity. The king tried to solve this problem by looking to the German principalities where his grandfather was born. Americans referred to all of the German mercaneries as Hessians, though many came from principalities other than Hesse-Cassal and Hesse-Hanau. Nearly 30,000 Germans were shipped to America and they made up about one-third of the King's army. They were bitterly resented by the colonists, who felt their king had turned foreign enemies loose on his own people. 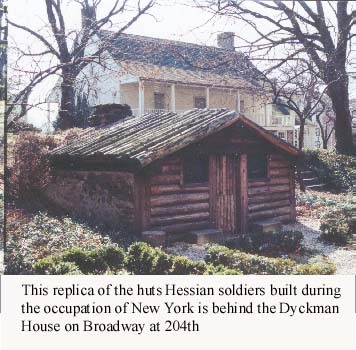 The Hessian hut near the Dyckman House was erected in 1915-17 from original materials. The Hessians camped on the estate during the occupation of New York. Though the Dyckman family settled the area in 1661, the present house was built in about 1785. Both the hut and house are maintained by the city parks department. Address: 4881 Broadway, at 204th Street. Hours: Tuesday to Sunday, 11 a.m. to 4 p.m., call to confirm. 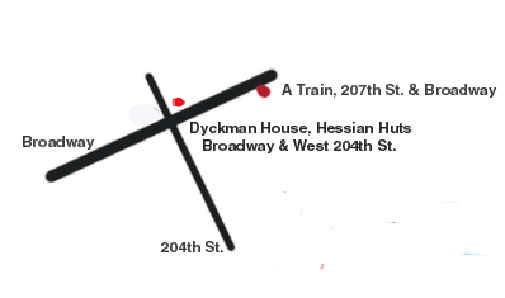 Transportation: Take the A Train to 207th Street. Walk south on Broadway to 204th Street. Bibliography: Historic Houses in New York City Parks, Historic House Trust of New York City and City of New York Parks & Recreation, New York, 1992.